Luxury is not about appearances, on the contrary, it is about being understood, finding satisfaction in the small details and gathering inspiration through artistic expression. The journey crafted at Elizabeth Unique Hotel touches both the ancient and the contemporary with the additional privilege of becoming part of a community of illuminated travelers. Besides the artistic and cultural cross-pollination, Elizabeth Unique Hotel offers all services peculiar to big five-star hotels, with unprecedented criteria of personalization. We believe that today more than ever, a sophisticated guest wishes and expects to experience unique, genuine, extraordinary, priceless moments: this is the real criterion to define luxury, and its trademark. We undertake to offer an alternative to the existing globalized and standardized system and to value what is rarest, more authentic, more precious and moving, in order to put it at our guests’ disposal. We address ourself to individuals, not to targeted customers, who associate the word ‘luxury’ to self-referential operators, who abuse it and cannot ‘walk it like they talk it’ anymore. We stick to our philosophy in every field, with care and consistency. We respect and care for our personnel and keep looking for new ways to involve and motivate them, in order to develop an incomparable sense of belonging. Actual quality, not just the sense of it. Every detail, relating both to aesthetic and to service, has been conceived and realized without compromise. Our ultimate technological systems guarantee the maximum comfort, safety and prevention. The hotel operates in compliance with regulations and is in possession of all titles, permissions and authorizations required by competent public bodies. We believe that brilliant intuitions and artistic masterpieces are an extraordinary cultural reservoir one can draw from. Creativity and the courage to dare and to experiment, starting from sound historical-cultural bases, are the catalysts that urge us to explore new kinds of hospitality. From the concept of spaces to the furniture, from the atmosphere to the reception of our guests. Such impulses inspire our artisans, who apply them to the matter. We shun industrial production, which would spoil the balance between innovation and authenticity. Also in the field of in-house catering, we choose no compromises, even though this entails complex logistics: we buy locally sourced products and prefer homemade foods, such as the bread and confectionery prepared in our kitchens. Raw materials eaten close to their growing site are an incentive to respect origins and traditions. A simple and genuine approach that resumes our ancestors’ ancient habits. We carefully select a group of local producers who can guarantee healthy food and unique tastes, so as to depart from large-scale retail trade. We fight against decay and decline, deploying ethical, aesthetical and environment-friendly values. We believe that making a profit is not the cause, but the effect of pursuing quality. We wish to honour our artistic and cultural heritage through heterogeneous collaborations with exponents of the city’s culture who come from different intellectual paths. 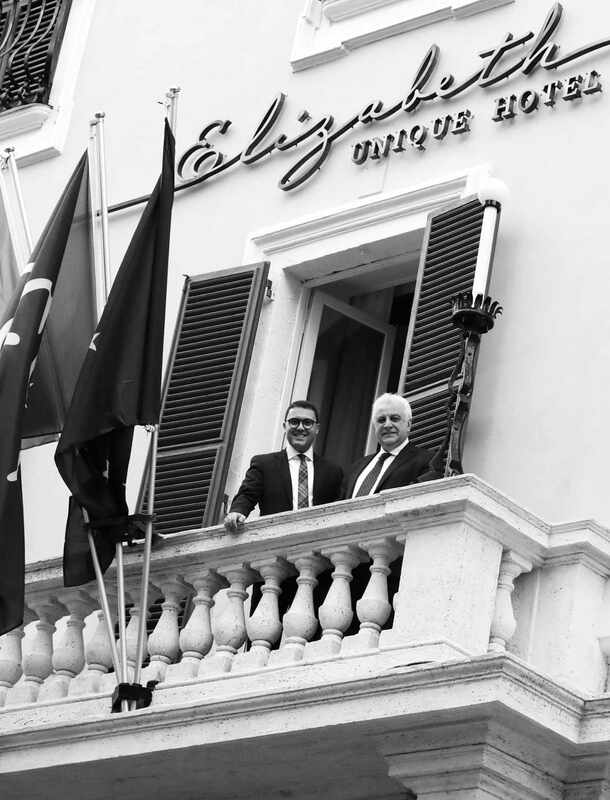 Elizabeth Unique Hotel is a sincere and pure dedication, written with admiration and gratitude. It is a homage to Signora Elisabetta, mother and grandmother of the founders. A key woman figure who left the indelible signs of her love and the incomparable example of a unique authentic hospitality.